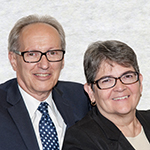 Ross Alan Clark, 66, and Ana Luisa Gutierrez Clark, six children, Heritage Ward, Calgary Alberta Stake: Cove Fort (Utah) Historic Site. Brother and Sister Clark recently served as senior missionaries in the New York New York North Mission. Brother Clark is a former high councilor, bishop, stake executive secretary, and temple ordinance worker. Retired executive vice president and director, Kallisto Energy Corporation. Born in Redlands, California, to Henry Ward and Ethel Irene Webster Clark. Sister Clark is a former ward Relief Society and Primary president, young single adult adviser, Scout leader, and temple ordinance worker. Born in Calexico, California, to Jose Luis Gutierrez and Aurora Gonzalez Gutierrez.